For other places in New York with the same name, see Lake George, New York (disambiguation). For other bodies of water with the same name, see Lake George (disambiguation). Lake George drains into Lake Champlain to its north through a short stream, the La Chute River, with many falls and rapids, dropping 226 feet (69 m) in its 3.5-mile (5.6 km) course—virtually all of which is within the lands of Ticonderoga, New York and near the site of the Fort Ticonderoga. Ultimately the waters flowing via the 106-mile-long (171 km) Richelieu River drain into the St. Lawrence River downstream and northeast of Montreal, and then into the North Atlantic Ocean above Nova Scotia. Lake George is located in the eastsouthern Adirondack State Park and is part of the St. Lawrence watershed. Notable landforms include Anthony's Nose, Deer's Leap, Diver's Rock (a 15-foot [4.6 m] jump into the lake), and Double-Diver's (a 30-foot [9.1 m] jump), the Indian Kettles, and Roger's Rock. Some of the surrounding mountains include Black Mountain, Elephant Mountain, Pilot Knob, Prospect Mountain, Shelving Rock, Sleeping Beauty Mountain, Sugarloaf Mountain, and the Tongue Mountain Range. Some of the lake's more famous bays are Basin Bay, Kattskill Bay, Northwest Bay, Oneida Bay, and Silver Bay. The lake is distinguished by "The Narrows", an island-filled narrow section (approximately five miles [8 km] long) that is bordered on the west by the Tongue Mountain Range and the east by Black Mountain. In all, Lake George is home to over 170 islands, 148 of them state-owned. They range from the car-sized Skipper's Jib to the larger Vicar's and Long Islands. Camping permits are attainable for the larger portion of islands. The lake's deepest point is 196 feet (60 m), between Dome Island and Buck Mountain in the southern quarter of the lake. The northern end of the lake that is located near Ticonderoga is considered the southern end of the Champlain Valley, which includes Lake Champlain, as well as the cities Plattsburgh, New York and Burlington, Vermont. There are six known invasive species in Lake George. The Asian clam first found in 2010 is the biggest threat, along with the Eurasian watermilfoil. Other invasive species are the Chinese mystery snail, curly-leaf pondweed, spiny water flea, and zebra mussel. The lake was originally named the Andia-ta-roc-te by local Native Americans. James Fenimore Cooper in his narrative Last of the Mohicans called it the Horican, after a tribe which may have lived there, because he felt the original name was too hard to pronounce. The first European visitor to the area, Samuel de Champlain, noted the lake in his journal on July 3, 1609, but did not name it. In 1646, the French Canadian Jesuit missionary Isaac Jogues, the first European to view the lake, named it Lac du Saint-Sacrement (Lake of the Holy Sacrament), and its exit stream, La Chute ("The Fall"). On August 28, 1755, William Johnson led British colonial forces to occupy the area in the French and Indian War. He renamed the lake as Lake George for King George II. On September 8, 1755 the Battle of Lake George was fought between the forces of Britain and France resulting in a strategic victory for the British and their Iroquois allies. After the battle, Johnson ordered the construction of a military fortification at the southern end of the lake. The fort was named Fort William Henry after the King's grandson Prince William Henry, a younger brother of the later King George III. In September, the French responded by beginning construction of Fort Carillon, later called Fort Ticonderoga, on a point where La Chute enters Lake Champlain. These fortifications controlled the easy water route between Canada and colonial New York. A French army, and their native allies under general Louis-Joseph de Montcalm laid siege to Fort William Henry in 1757 and burned it down after the British surrender. During the British retreat to Fort Edward they were ambushed and massacred by natives allied to the French, in what would become known as The Massacre at Fort William Henry. On March 13, 1758, an attempted attack on that fort by irregular forces led by Robert Rogers was one of the most daring raids of that war. The unorthodox (to Europeans) tactics of Rogers' Rangers are seen as the inspiring the later creation of similar forces in later conflicts—including the United States Army Rangers. Lake George's key position on the Montreal–New York water route made possession of the forts at either end—particularly Ticonderoga—strategically crucial during the American Revolution. Later in the war, British General John Burgoyne's decision to bypass the easy water route to the Hudson River that Lake George offered and, instead, attempt to reach the Hudson though the marshes and forests at the southern end of Lake Champlain, led to the British defeat at Saratoga. On May 31, 1791, Thomas Jefferson wrote in a letter to his daughter, "Lake George is without comparison, the most beautiful water I ever saw; formed by a contour of mountains into a basin... finely interspersed with islands, its water limpid as crystal, and the mountain sides covered with rich groves... down to the water-edge: here and there precipices of rock to checker the scene and save it from monotony." 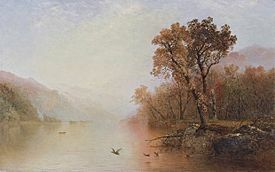 In the late 19th and early 20th centuries, Lake George was a common spot sought out by well-known artists, including Martin Johnson Heade, John F. Kensett, E. Charlton Fortune, Frank Vincent DuMond and Georgia O'Keeffe. On October 2, 2005, at 2:55 p.m., the Ethan Allen, a 40-foot (12 m) glass-enclosed tourist boat carrying 47 passengers and operated by Shoreline Cruises, capsized during calm weather on the lake. According to reports from a local newspaper, 20 people (mostly senior citizens) died. Initial reports indicated that the tour group was from Canada, but these reports were later found to be incorrect. It was later determined that the group was from the Trenton, Michigan, area on a week-long fall trip along the East Coast by bus and rail, organized by Trenton's parks and recreation department and arranged through a Canadian company. Police said they had never seen a disaster of this magnitude on the lake. The captain survived and cooperated with police. The National Transportation Safety Board investigation of the incident revealed that, although the boat was rated to carry 50 people when it was manufactured in 1966, subsequent alterations to the boat's design had greatly reduced its stability. At the time of the accident, the boat should have been rated to carry no more than 14 passengers. On February 5, 2007, the captain, Richard Paris, and the company that owned the boat, Shoreline Cruises, were indicted for having only one crew member aboard the boat. More serious charges were not filed because neither the captain nor the owners were aware they were violating safety standards. Situated on the rail line halfway between New York City and Montreal, Lake George attracted the era's rich and famous by the late 19th and early 20th century. Members of the Roosevelt, van Rensselaer, Vanderbilt, Rockefeller and Whitney families visited its shores. The Fort William Henry Hotel, in what is now Lake George Village, and The Sagamore in Bolton Landing opened at this time to serve tourists. The wealthiest visitors were more likely to stay with their peers at their private country estates. The Silver Bay YMCA on Lake George was constructed in 1900. It has since evolved into a summer family camp, serving several hundred organizations and tourists every summer. Since 1913, on the East Shore of Lake George, YMCA Camp Chingachgook has hosted thousands of guests every summer. Today, Lake George remains a tourist destination, resort center, and summer colony. A popular activity in the Lake George area is hot air ballooning. One of the nation's oldest gathering of hot air balloons occurs every September in nearby Glens Falls. Millionaire's Row is the nickname of a stretch of Bolton Road (now Lake Shore Drive) on the west side of the lake where millionaires built mansions for use during the summer months. Such notables as Spencer Trask and Robert Pitcairn built palatial summer homes here. Although sometimes called "cottages" by their owners, these grand houses typically had dozens of bedrooms and more than 20,000 square feet (1,900 m2) of floor space. Millionaire's Row differed markedly from the more rustic summer "camps" built by other wealthy Adirondack summer residents such as William West Durant and John D. Rockefeller. Unlike the log and timber structures at the camps, the houses of Millionaire's Row were built of stone and masonry in the Tudor Revival, Georgian Revival and Italianate styles. Unlike their contemporaries in Newport and the Hamptons, which were built on tiny pieces of land, the cottages of Millionaire's row were mansions in the true sense of the word. They were often built on hundreds of acres of pristine lakeside wilderness. With the changing economic climate and the introduction of income tax, the mansions of Millionaire's Row became less sustainable by the 1930s. By the 1950s, with the advent of affordable auto and air travel, Lake George became more attractive to the growing middle class and less so to the "jet set". Most of the mansions of Millionaire's Row were torn down or turned into hotels and restaurants. Among the surviving "cottages" are Melody Manor, Sun Castle (Erlowest), and Green Harbor Mansion. Lake George, on a foggy day. 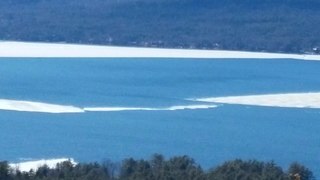 View of southern end of Lake George. ^ "Lake George". Museo Nacional Thyssen-Bornemisza. ^ "Invasive Species". Lake George Association. ^ "Lake George Historical Society". lakegeorgehistorical.org. ^ Gannett, Henry (1905). The Origin of Certain Place Names in the United States. Govt. Print. Off. p. 136. ^ The Albany Times Union, TRAGEDY ON LAKE GEORGE, Special Report; retrieved May 12, 2008. ^ "Captain Indicted in Fatal Boat Accident". Associated Press. February 5, 2007. Wikimedia Commons has media related to Lake George (New York). Wikisource has the text of a 1911 Encyclopædia Britannica article about Lake George. "George, Lake" . The New Student's Reference Work . 1914.